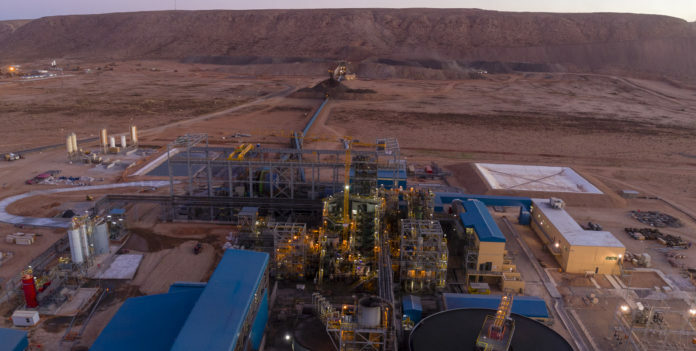 VEDANTA Resources is starting to ramp-up production from its Gamsberg zinc mine at Aggeneys in the Northern Cape in a development which has huge potential benefits for both the group and the Northern Cape region. Having taken the decision to go ahead with construction of the $400m project during a downturn in the zinc market, Vedanta is now bringing Gamsberg on line at a time when soaring zinc prices mean the mine is looking at profit margins of more than 100%. The zinc price currently sits around $2,700/t. Targeted operating cost of production at Gamsberg is $850/t of zinc metal in concentrate produced. First ore from the mine was produced in January 2018 and at full output – which should be reached within six to nine months – Gamsberg will mill four million tonnes of ore annually to produce 250,000t/year of zinc metal in concentrate. Phase One has an estimated life-of-mine (LOM) of 13 years, but it is what could come next that is a potential game changer for both Vedanta and the Northern Cape region. Naidoo said Vedanta had been attracted to Gamsberg because zinc is a core commodity for the group and because of the size of Gamsberg which is one of the largest zinc ore bodies in the world. Gamsberg was discovered more than 40 years ago but its previous owners – the former Gold Fields of South Africa and Anglo American Corporation – opted not to develop the project and instead focused on running the adjacent Black Mountain zinc mine. The reason for this its low ore grade which averages around 6.5% zinc, and the fact that it contains relatively high levels of manganese which is a contaminant. Vedanta’s use of a system of blending ore production has allowed the mine to manage the manganese level in the final concentrate product and hold it to a target of 2.5% compared with the benchmark level of 3% that its customers are prepared to accept. There are three projects in the pipeline which could push zinc output from the region to one million tonne a year – including the existing Black Mountain mine and the nearby Skorpion mine in Namibia which Vedanta also owns – of which the most important is a potential zinc refinery and smelter at Gamsberg which would cost between $700m and $800m. That’s the game changer for the region because the refinery would produce around 1,000t of sulphuric acid a day in addition to around 300,000t of high grade zinc metal annually. It is potentially the most significant economic development for the region since the former Iscor decided to develop the Sishen iron ore mine and associated rail link to Saldanha Bay back in the mid 1970’s. That sulphuric acid output could be used to set up a fertiliser/phosphate chemical industry hub in the Northern Cape as well as being sold to users elsewhere in South Africa. But to make the refinery viable Gamsberg needs a reliable, additional 200MW of power at a viable tariff as well as a complete overhaul of transport logistics in the region. The current production from Black Mountain is being trucked to Loop 10 on the Sishen – Saldanha railway line and then railed to Saldanha. Naidoo concedes that situation is “not ideal”. To turn Vedanta’s vision into reality government and various state-owned organisations such as Eskom and Transnet along with the IDC have to “come to the party”. Cross-questioned on the likelihood of this actually happening given the current problems at Eskom in particular, Naidoo replied that developments would be done through a “phased, modular strategy” with the involvement of independent power producers. Challenged again over Eskom and other government failures Naidoo replied: “We are under no illusions that this will be easy to do. “It will involve a strategy of risk mitigation but you are asking me a fundamental question – do I believe in South Africa? – and, long-term, I am taking my chances on this country as a proud South African”. Next articleMiners exercise restraint, but can counter-cyclical investing be institutionalised?